Another beautiful sink from overstock. Dimensions 33.0 In. X 22.0 In. X 10.7 In. I love this sink! It’s nice and big! I love that it’s deep on the big side and more shallow on the smaller side. We got it in black, along with the Kraus strainer to match and it’s beautiful! We top mounted for now, but plan on transitioning it to an undermount when we remodel. Great price and product! 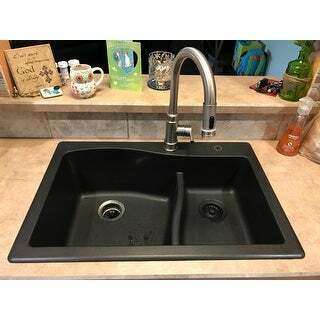 Absolutely love my Kraus sink, it is not noisy at all. Doesn't mark, doesn't scratch, cleans easy, nothing sticks to it. I got the dark brown and love the color. My plumber did complain that installing my Kraus faucet was difficult because the underside of the sink is not flat. I've always been happy with my Kraus products, they are well made and hold up. I cannot say enough about this sink. I absolutely love it. To be honest I was hesitant to buy it at first because I wasn't sure if the color was as pictured but I am so glad I went with my instincts. The quality and the design of this sink was definitely beyond my expectations. The installation was a breeze and the color is perfect. I love how big the deep part of the sink is & the fact that when both sinks are fille it becomes big enough for the largest items needing to be washed. I chose the black sink & would definitely recommend it. We remodeled our kitchen and we decided to go with this sink. Love it. It is easy to clean. We also got the gray stopper to match. It fits and makes the kitchen look very elegant. I’m happy for the purchase. Came in perfect condition. Absolutely beautiful! Exceptionally functional! Just what I wanted and true to description. Love it and haven't found a big pan or kettle or baking sheet that doesn't fit... no more fighting with pan handles or baking sheets. Highly recommend and am beyond happy with this purchase. Great look. Easy to install and very sturdy. Comes with easy to read directions. Love this sink, good quality and price. Beautiful sink but it arrived with 2 hairline cracks and a chipped off corner. 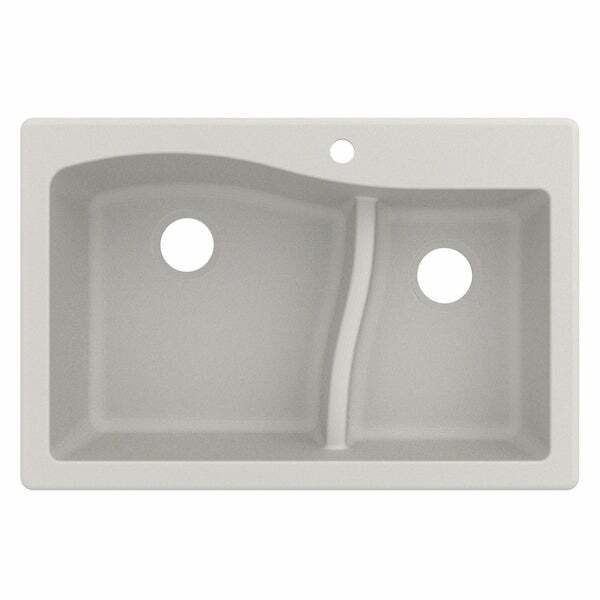 The composite sinks are susseptable to that I suppose. Love everything about this sink. Great for pots with a handle . Looks great, too. I bought this sink for my lake home. It beat my expectations. Beautiful and easy to clean. I liked it so much, I purchased another one for my main residence. Got both in the grey. I liked the quality and shipping packaging as well as the stylish look. Great price too! "can another hole be drilled"